This year, the Evolution Championship Series is giving nine fighting games the chance of a lifetime. The game that raises the most money for Make-a-Wish International (a non-profit organization dedicated to making the dreams of children with life-threatening conditions reality) will earn a spot during the prestigious Sunday finals. But with Evo 2017 donations in full swing, the tensions and disappointments of past years have resurfaced. 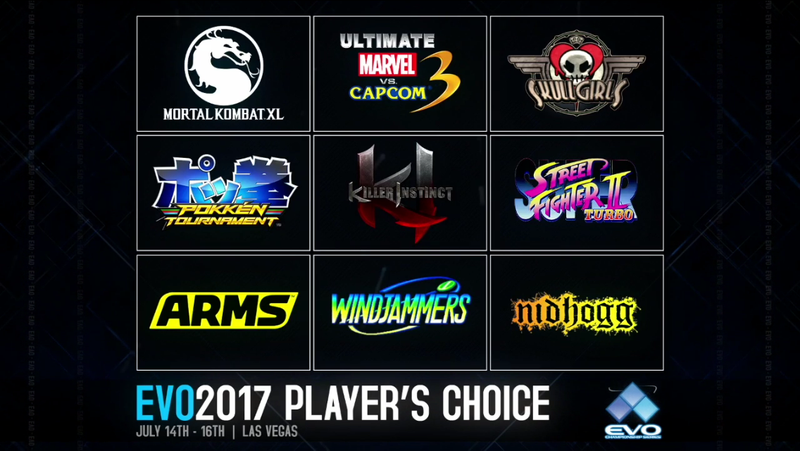 The games up for voting this year include previous entrants Ultimate Marvel vs. Capcom 3, Pokkén Tournament, Mortal Kombat X, Killer Instinct, and even the iconic Super Street Fighter II Turbo. Evo is the largest and most important fighting game tournament in the world; as such, the disparate subgenres of the fighting game community wait with bated breath every year to see if their favorite games are included in the official lineup. The Evo organizers periodically go out of their way to open a spot to community voting and help a worthy cause at the same time. While the donation drive has been cordial over the past week, things were a bit more heated the last time such a campaign was organized in 2013. The fanatical Super Smash Bros. Melee community (which had been absent from the tournament series since the game’s 2007 debut) had moved to the front of the pack almost immediately, but it faced stiff competition from indie darling Skullgirls. The results would affect not only Evo 2013 but the entire fighting game community for years to come. Developed in part by longtime competitor Mike Zaimont, Skullgirls was embraced by a small but dedicated group of players when it launched in 2012. But even with its pedigree, the indie darling failed to make a splash in the Capcom-dominated fighting game community. When Skullgirls was included in the Evo 2013 vote, its fans were not about to let the opportunity pass them by. Melee, on the other hand, was in decline. Many saw inclusion at Evo 2013 as the next step to reviving the stagnant community. As 2013’s fundraising drew to a close, the fighting game community had contributed over $225,000 to the Breast Cancer Research Foundation, with Melee’s $94,000 in donations beating out the $49,000 contributed by Skullgirls players. Last-minute pushes resulted in around $120,000 being raised during the final day alone. But even as spirits were lifted by these charitable donations, the contest felt largely unfair for the games left out of Evo 2013. Arguments concerning who deserved to be at Evo more, inspired by the fundraising competition, had left an indelible mark on the larger community. Despite an often shaky relationship with traditional fighting games, Melee was once again going to be part of the genre’s largest competition. In the years since, the Smash community has seen a ridiculous resurgence, growing from a fading memory to a staple of Evo competition. Skullgirls, unfortunately, was never able to make the main stage, but players carved out their own niche at events like the Chicago-based Combo Breaker. Despite the controversial addition of Injustice: Gods Among Us (which only raised $77 in the same donation drive) to the Evo 2013 lineup later on, the Skullgirls community has never let the emotional weight of these repeated snubs define them, and they continue to thrive by forging their own path. With Evo 2017 donations in full swing, this year’s competition still carries the weight of 2013. Although Skullgirls is included in this year’s campaign, the players have largely ignored Evo’s calls for contributions, providing only $672 in the past week. Despite the money going to a good cause, some see another attempt at Evo recognition as a pipe dream not worth pursuing. The lingering emotions of years past have only served to sour some community members on the entire campaign, and an unhealthy, Evo-centric atmosphere has permeated through the rest. Just like in 2013, a different pair of games is now slugging it out for the honor of being featured at Mandalay Bay. Ultimate Marvel vs. Capcom 3 and Pokkén Tournament are two rather interesting cases. The former has been mainstay at Evo since its 2011 release, and the latter saw over 1,000 competitors during its debut last year. The announcement of Marvel vs. Capcom Infinite has put an expiration date on Ultimate Marvel vs. Capcom 3’s lifespan. Meanwhile, a lack of developer support has made hope in Pokkén Tournament an all-too-rare commodity. Both games have legitimate claims to another appearance, whether as a swan song before a new title launches or as thanks for showing up in such large number at Evo 2016. Fortunately, fundraising has been quite amicable compared to the drive in 2013, but some in the fighting game community still question whether this kind of vote is the best way to choose games for such an event, especially with the divisions it’s encouraged in the past. The inclusion of joke entries, like unreleased Switch title ARMS and cult classic Windjammers, over games with healthy communities further serves to undermine Evo’s importance. When all is said and done, Evo 2017 is sure to be a spectacular tournament. But as the fighting game community continues to expand, Evo’s status has changed. Where it was once considered the pinnacle of competition, it now functions as more of a celebration of the genre. The competitive nature of Evo’s fundraising drive has inspired some communities, like Mortal Kombat X, to bow out altogether in favor of organizing dedicated side tournaments. The gap separating Evo and other high-caliber events is growing smaller and smaller, and players disappointed by their experiences at Evo have a huge number of similarly important tournaments they can attend across the world instead. Like Skullgirls, it’s important for players who find themselves on the outside looking in to not let occasional tunnel vision define their futures. Should Ultimate Marvel vs. Capcom 3 miss out on Evo 2017, it still has tournaments like Undefeated and Curleh Mustache (not to mention and the impending release of Marvel vs. Capcom Infinite) to fall back on. Pokkén Tournament has been welcomed with open arms by east coast organizers Larry “Shin Blanka” Dixon and Eric “Big E” Smalls despite a dearth of attention by its creators. And Killer Instinct, which currently sits in a distant third place, continues to earn outstanding support from developer Iron Galaxy Studios and enjoys regular high-level competition because of it. Games that don’t make it into Evo can still flourish. The fighting game community is different from other eSports scenes due to the sheer number of titles huddled under its umbrella. Sometimes it can be hard to find the space a game’s community feels it deserves, especially with so much real estate being given to bigger franchises. But, like Zaimont said in 2013, everyone contributes to making the greater community what it is, from the 5,000 competitors duking it out in Street Fighter V at Evo 2016 to the Melty Blood diehards playing off a tiny laptop screen in the parking lot. To survive, concessions need to be made, especially at a tournament as important as Evo, but it’s also important to diversify the attention granted to underrepresented games and events. Asking, “Which games deserve to be at Evo?” only works to widen the cracks that naturally form between passionate communities.